Brain injuries account for half of all injuries from falls, according to a 2005 study from the Centers For Disease Control. The video captured on a security camera depicts an elderly man who is very weak. He was able to right himself, but the aftermath is anyone’s guess. Falling down steps, especially moving steps like an escalator, isn’t a laughing matter. A stay in the hospital is no joy ride. If you’re leading a sedentary lifestyle, get up and start moving. Make regular exercise a lifelong habit, so you won’t wind up falling down an escalator when you’re 70 years old. Are you weak and fearful of hurting yourself? Than start doing daily core exercises. The Tree Pose, and All Fours Balance Exercise are two basic balancing exercises that will help strengthen your core. The following links will take you to posts I’ve written about core exercise. 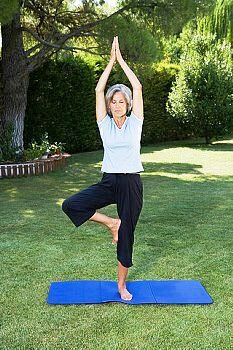 Posted on August 27, 2012, in Aging, Exercise, Exercise Injury Prevention and tagged Center for Disease Control, Centers for Disease Control and Prevention, core strength, Head injury, muscle atrophy, Old age, Sedentary lifestyle, side plank, yoga. Bookmark the permalink. Leave a comment.